Irish Portrait Painter, 18th Century, Biography and Paintings. Considered to be the most distinguished Irish portrait artist of the first half of the eighteenth century, James Latham was almost certainly born in Thurles, County Tipperary. Speculation exists that he was taught by the great Garret Morphy (c.1655-1715), but so far no written evidence has emerged about his early training as a painter, although we do know (from the art historian Anthony Pasquin, in his 'Memoirs of the Royal Academicians and an Authentic History of the Artists in Ireland', 1796) that Latham studied for one academic year in Antwerp (1724-5). However, he had started painting some years before this, having acquired local patronage through the second Duke of Ormonde. Latham is believed to have been a Protestant, which if true would have given him easy access to patrons among the Anglo-Irish ruling classes, including Catholics. 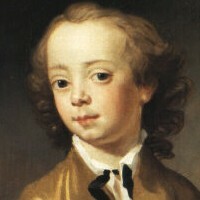 Early examples of his portrait art include paintings of James Butler, and Christopher Butler Catholic Archbishop of Cashel, both dated before 1720. After returning from Antwerp (from which time his work becomes noticeably more subtle), Latham established himself in Dublin, where - despite some evidence of an occasional trip to London - he remained until his death, at the age of 51. Regarded by contemporary critics and historians as one of the most talented painters of his day - Anthony Pasquin actually refers to him as Ireland's Van Dyck - he was influenced by Continental masters (especially in his portrayal of fabrics), as well as portraitists like Charles Jervas, William Hogarth and Joseph Highmore. His portraiture included half, three-quarter and full length works, as well as a number of double portraits such as Bishop Robert Clayton and his Wife (c.1734). His portrayal of children and other ancilliary items like flowers was also exemplary. Curiously, in 1900, only one painting by Latham had been positively identified. Since then, the number has grown to more than 85. He is now regarded as one of the major Irish artists of the eighteenth century. The auction record for a work by James Latham was set in 2009, when his portrait painting, entitled Portrait of a Lady in a Blue Dress and a Straw Hat, holding a Rose, was sold at Christie's, in London, for £22,500.  For the development of Irish portrait painting, see History of Irish Art.